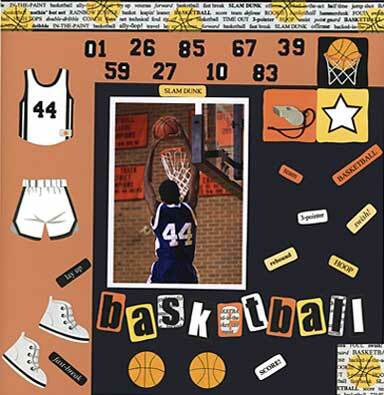 My basketball scrapbook layout shows exactly what my basketball-playing stepson would look like if he slam-dunked with a no 44 on his back. As I didn't own such a photo, this one is a great likeness! Well, if I'd pretended that the guy in this photo WAS my stepson, now that WOULD have been cheating. For the purpose of this basketball layout, I wanted an action shot with no blurring. I have never taken an action shot without blurring, so that's my excuse. If there's one place you can guarantee noise it's on a basketball court. I wanted to create 'noise' in this layout by laying bright colours on black. The page kit was great for this purpose. I have, however, discarded the packaging and have forgotten who makes it. I've searched on the web for the supplier, and haven't given up. I will add the supplier as soon as I trace them! I put this basketball scrapbook layout together 'on the fly' - not really planning it at all. ('I know', I can hear you say!). These days I'm more likely to take a leaf out of Jen Gormley's excellent book '500 Scrapbooking Sketches' so I can have a clear idea of where the layout is headed. In fact if you scroll down to almost half way down this page you'll see a good example of how a simple line sketch can morph into a great looking layout.